Push the button and mulch with the exclusive John Deere MulchControl™ System with One-Touch Technology. The chute closes and you have a dedicated mulching system. 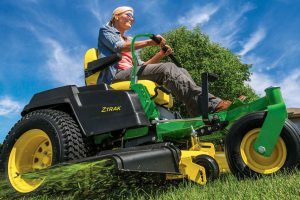 Perfect for regular, weekly, or bi-weekly mowing. The exclusive John Deere MulchControl™ Kit with one touch technology is the easy way to mulch. With the push of a button you can mulch when you want to. 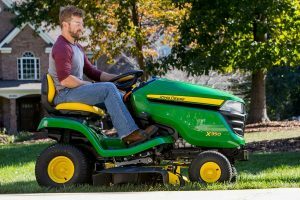 Push the button or pull the lever, with your exclusive John Deere MulchControl™ System, the chute opens and you can side-discharge mow or bag. The choice is yours. Mulch lawn clippings and leaves for better lawns. Mulching returns valuable nutrients and organic matter to soils and can even help prevent weeds. It’s best to use the same cutting height week-to-week to optimize plant root growth. However, never take more than 1/3 off of the grass blade at one time, even if it means mowing more often.